Warren Buffett remains confident in American Express (AXP), one of his four largest holdings, which is down 15% this year. Buffett seems to still believe in AmEx’s brand, benefits from their share repurchases, and has expressed confidence in management. However, I think he could be doing much better with similarly valued competitors Capital One (COF) and Discover (DFS), or pricier alternatives Visa (V) and Mastercard (MA). AmEx’s growth picture looks bleak: They’re expected to report down sales and earnings this year, and meager 1% sales growth next year. Their balance sheet contains $54.7 billion of long term debt, which requires $1.7 billion a year in interest service. Their margins and returns on capital lag their competitors. While AmEx might be able to turn it around given enough time, investors are much better off with alternatives. In this article, I’ll use Stock Rover to compare AmEx to its main competitors, which fall into two groups. Visa and Mastercard both trade at substantial premiums to AmEx, but have almost no debt and prospects for double digit growth. As a result you see current P/Es around 30, but a 2016 P/E around 23, and more expensive free cash flow yield. Capital One and Discover are both slightly cheaper than AmEx, but all three have tons of debt on their balance sheet and growth prospects limited to single digits – note that their 2016 P/Es aren’t much better than this year. Critically, Visa and Mastercard are payment processors only, and bear none of the risk of borrower default that Capital One, Discover or AmEx do. Along with their balance sheets, this makes much, much safer companies. We’ll see that Capital One’s and Discover’s metrics tend to outperform AmEx by a little, while Visa and Mastercard tend to outperform it by a lot. While AmEx has made Buffett a lot of money since he first bought it in the 1960s, we can see that it’s performance vs. the S&P 500 has been lackluster for most of the past decade. Below, I’ve set the S&P as a baseline. AmEx got crushed during the financial crisis, and has also declined precipitously over the past year. If you’re looking for a consistent outperformer, this isn’t it. If you look at how AmEx has performed against competitors Visa, Mastercard, Discover and Capital One over the past 5 years, the results look even worse for AmEx (in blue). 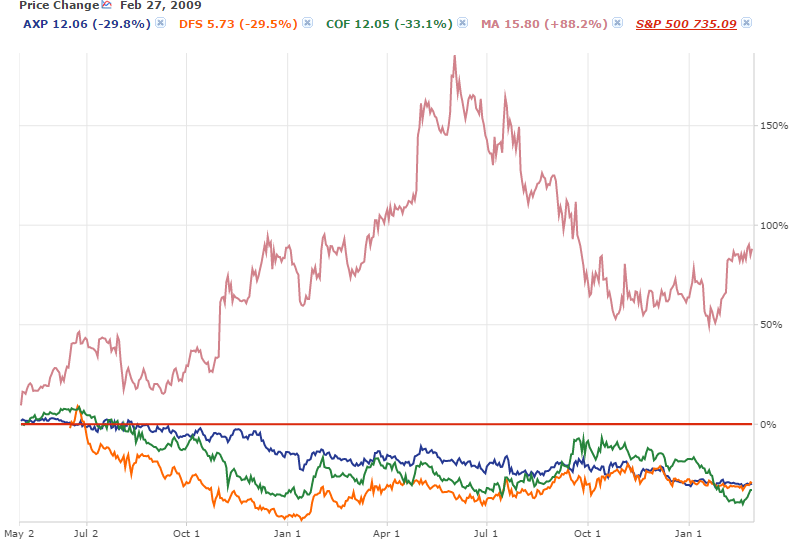 Visa, Mastercard and Discover have all performed about 200% better than the S&P over the past five years, while Capital One has done slightly better. But as they say, past results do not guarantee future returns. However, Amex’s future growth prospects also look dim. The company recently lost its exclusive partnership with Costco to Visa, taking away a large source of new card sign-ups. The company remains unpopular with merchants because of higher fees, and a judge recently ordered that AmEx cannot prevent merchants from advertising their preference for other cards. The expectation is for AmEx sales to be down 1.8% this year and up only 1% next year. The company is cutting costs, and projects a 4.4% earnings gain next year after a 1.8% earnings decline this year. But I’d rather own a company that’s providing earnings through growing sales instead of cost cutting. Those growth numbers, while poor on their own, are even worse compared to competitors. AmEx trades at a slight premium to Discover and Capital One, both of which expect around 5% sales growth this year and next. This translates into an estimated 7.7% earnings gain for Discover this year and 8.5% next year, while Capital one expects flat earnings this year and 5% growth next year. Visa and Mastercard trade at a considerable premium to AmEx, but they both project earnings growth in the high teens this year and next along with strong sales growth. 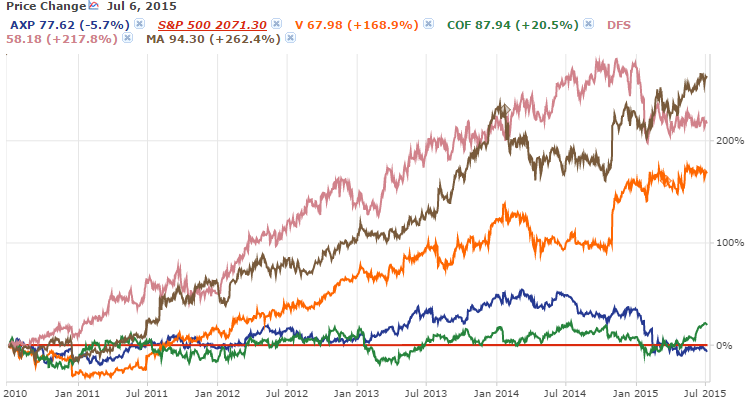 AmEx’s operating efficiency also underwhelms against competitors. We can see below that AmEx has the worst margins and free cash flow in the group, though it does have stronger returns on capital than its similarly-valued competitors. To be fair, AmEx’s margins and capital efficiency have improved consistently over the past few years, and may continue to improve as the company cuts costs. While some investors might be tempted to hold AmEx for its dividend, that dividend looks like nothing special against other credit card companies. AmEx has the lowest historical rate of dividend increase, and the highest current payout ratio of the group, suggesting future growth will be limited. AmEx’s yield also lags its cheaper competitors (the table below is sorted by dividend yield), and isn’t high enough to make AmEx a quality yield stock. Investors looking for dividends should keep looking. Balance sheets explain a big part of the valuation difference between the AmExes and Visas of the world. Here, I’ve sorted the table by debt/equity, where AmEx is worst in class with an unsafe 2.6. Visa and Mastercard carry almost no debt, which means much greater safety along with no debt service. Discover, Capital One and AmEx are all burdened with billions of debt, and billions more in debt service. Their Altman Z-Scores, designed to measure the chance that a company will go bankrupt, are dangerously low – safe companies generally have a score above 3. While AmEx does have the largest net income of the group, they also have the most debt, $54.7 billion. While management seems comfortable with this and has devoted substantial amounts of capital to share buybacks over the past several years, that much debt concerns me. If AmEx theoretically committed to spending all its earnings to eliminate its debt, it would take them the better part of a decade. More likely, they’ll carry the debt in the foreseeable future, and with it $1.7 billion a year in annual interest payments. To be fair, management has increased equity over the past several years, and AmEx does have pretty sizable percentage of their assets in cash. Nonetheless, that much debt presents a lot of risk, or at the very least cuts regularly into profits. The conventional wisdom on AmEx is that their more affluent clientele make them more recession resistant than other credit services. Even without considering their balance sheet troubles, we can examine this thesis by looking at the bottom that credit card companies hit in early 2009. AmEx did successfully avoid the losses that hurt many of their competitors, but their stock price took about the same hit as their peers. 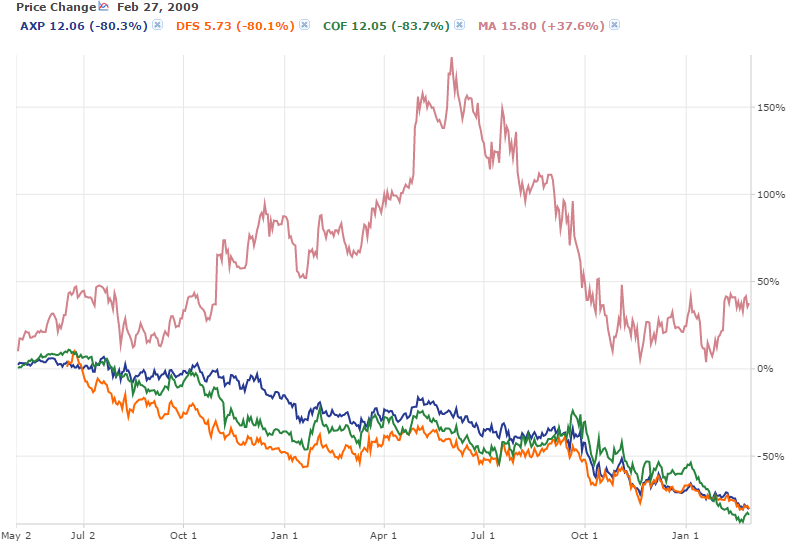 Below are price graphs from May 2007 to March 2009, which approximates the peak to trough decline of Amex, Capital One, and Discover (Mastercard’s peak came later, as you can see, and Visa didn’t begin trading until May 2008). 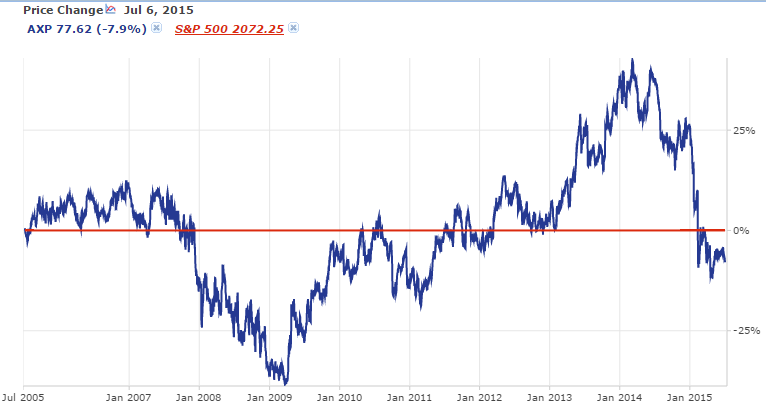 In the first graph, the S&P is set as a benchmark. AmEx, Capital One and Discover all moved pretty much together during the financial crisis, although their earnings at the time varied dramatically: AmEx stayed in the black every quarter, while Capital One took losses in Q1 2008 and the first three quarters of 2009, and Mastercard and Discover both reported red in mid-2008. AmEx’s share price was as vulnerable in the panic as the other companies, despite their continued ability to make money. AmEx may have helped make Warren Buffett a legend, but investors ought to move on. AmEx’s sales, earnings, margins, returns on capital, dividends, and balance sheet all underperform some or all of its competitors. AmEx doesn’t deserve any kind of safety premium, and its future growth prospects are poor. Investors could get more growth at a slightly cheaper price in Discover or Capital One, or pay for growth and safety in Visa or Mastercard. Any would be stronger than Buffett’s pick.